That's definitely a valid criticism. It takes a lot of time for your eyes to "adjust" to the bullets and shrapnel. 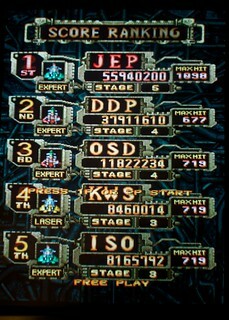 I'm going to play some Battle Garegga next. That's another one that I've sunk a ton of time into but haven't gotten close to the clear. I can see myself coming back to DOJ in a little while to try to unlock the second loop. Thanks moh! I've been playing it on and off for years. Finally decided to buckle down and get serious. I'm sure you could do it too. I managed to clear the first loop. This game is excellent. Looks cool! I would put in the original Dodonpachi. Very impressive! Final Fight is a tough game. Nice score! Are there any differences in Ghosts'n Goblins (US version)? Nice to see a real Daimakaimra resale version! I took a look at the manual and it's the 16-pin connector that I need (page 22). I didn't see any part numbers or description about what type of connector it is though (other than CN-MOWS). I recently picked up a Riverservice power supply for my new astro city but I don't see any adjustment pots for the voltage levels. Anyone know how to adjust the 5V line? This is the power supply: http://www.rs2006.co.jp/e/power_s/ac/index.html"
Good luck! I will say a prayer to the PCB gods for you. Willow is a great game.